We will see, on a coach, the most important buildings, avenues and squares with an expert official guide who will explain about the monuments, from the old Bourbons quarters, the "Puerta de Alcalá" and the City Hall, "Plaza de Cibeles", Gran Vía St., "Paseo de la Castellana", "Paseo del Prado"…, continuing to the Madrid of the skyscrapers and the business area of the city. 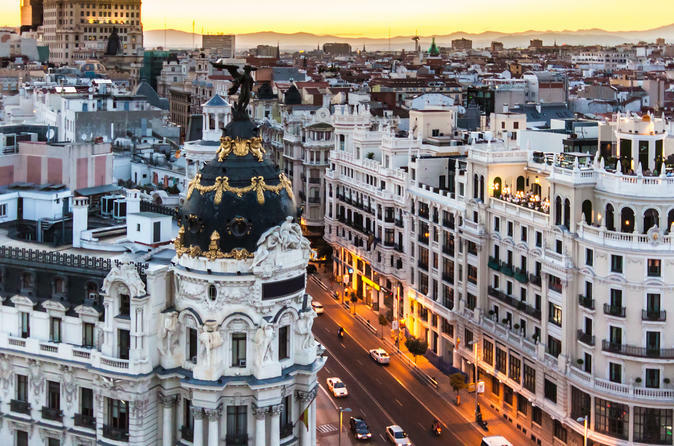 A 1.5-hour walking tour, through the old quarters of the city, known as "Madrid de los Austrias" (Habsburg Madrid) with a guide to know the impressive "Plaza Mayor", and walk down the stairs of "Arco de Cuchilleros" and the winding streets and alleys around "Plaza de la Villa". Continuing to Bailen Street where we will see the great neoclassic building of the Almudena Cathedral, ending our visit in the beautiful "Plaza de Oriente", where the Royal Palace is located. Upon arrival we start with a panoramic walking tour of Toledo, into the old quarters to visit the old Palace of Justice and the City Hall. We will continue our walk through the old Jewish quarter with its narrow streets to enter and visit the Church of St. Tomé, with the very famous painting of El Greco "El entierro del Conde de orgaz". Then we visit the old Synagogue of St. Maria la Blanca, which remains as a symbol of the coexistence of the "Three Cultures". We will also visit a typical factory of Damasquino, well known handicraft art of Toledo.